100 years after the 11th hour of the 11th day of the 11th month 1918, when the guns fell silent on the Western Front bringing an end to the First World War, a Service of Remembrance and 2 minutes’ silence was held at the War Memorial on the village green in Broadway, Worcestershire. 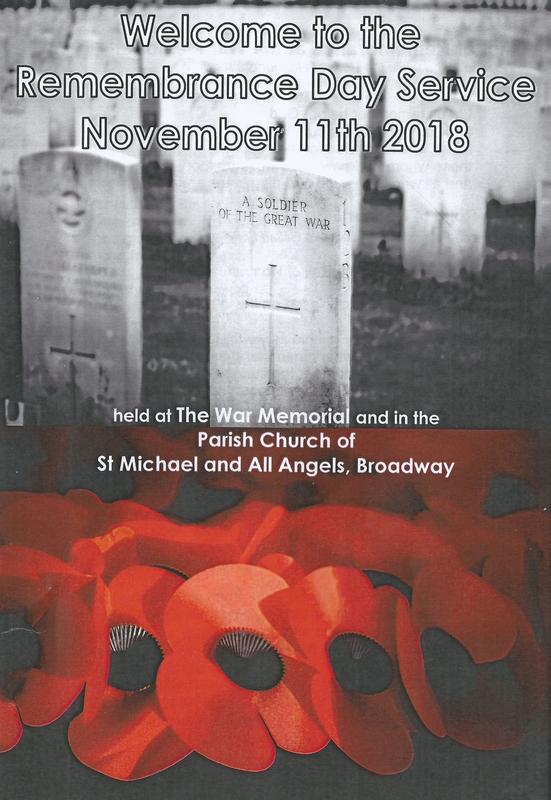 This was followed by a service in St Michael and All Angels’ Church to remember all the lives sacrificed in the service of our country and those traumatised and injured in conflict. HENSLEY, Kenneth Andrew, Second Lieutenant, Royal Warwickshire attached North Rhodesia Regiment. KILLED IN THE GREAT WAR. As these men are not commemorated on the war memorial on the green in the village, and were not resident in Broadway when they enlisted and served in the First World War, I did not include them in my book, Broadway Remembers. However, I feel that these men should not go unmentioned as they were close relatives of Broadway’s doctor, Charles Turner Standring who served the village for many years. Charles Standring was born in Lewisham, Kent, in 1865, the sixth son of John and Elizabeth Emma Standring. Charles was educated at Blackheath School and King’s College London. He studied medicine and took the diploma of Licence of the Society of Apothecaries (LSA) in 1891. After serving as a house surgeon at Shrewsbury Hospital and as a doctor’s assistant in various parts of the country, Charles, his wife, Caroline Matilda (nee Clayton), and daughter, Dorothy, settled in Broadway. Charles was an active member of the community and was known as the ‘sporting doctor’: he founded Broadway Golf Club and was Honorary Secretary of the Club for 26 years. Broadway Golf Club was initially sited where Broadway Cricket Club is today on Snowshill Road before Charles initiated its relocation. The Club eventually settled on its current site in 1911 at the top of the hill above Broadway. Charles was also an active member of Broadway Tennis Club and Broadway Cricket Club (he was a team member of J.M. Barrie’s ‘Allahakbarries’ who played in cricket matches in Broadway in the late 1890s). Charles also founded Broadway Football Club and Broadway Hockey Club. He lived with his wife and daughter at The Laurels (now Broome House), Church Street, Broadway, where Charles practised until his death on 8th November 1924, aged 59. Ben Standring was born in 1886 in Oporto, Portugal, the only son of wine merchant Arthur Hamilton (Charles’s oldest brother) and Ellen Standring. He was educated at the Oporto British School and Charterhouse (Bodeites) in Surrey (from 1900 to 1904). Ben initially enlisted in 1909 with the 28th London Regiment (Artists’ Rifles) becoming a Corporal and then a Sergeant. Following the outbreak of the war, Ben proceeded to join the Expeditionary Force in France on 26th October 1914. At the time of his enlistment his parents were living at Heath Bank, Blackheath Rise, Lewisham in Kent. Shortly after the Artists’ Rifles arrived in France they became an Officers’ Training Corps and in November 1914, Ben received his commission in The Royal Warwickshire Regiment which he joined at the front. He was wounded in action at Rouges Banes on 19th December 1914 and died the same day. Ben is buried in Sailly-Sur-La-Lys churchyard in the Pas du Calais, France and is commemorated on the 1914-1918 Roll of Honour in St Mary Magdalene Church, Chiswick, Middlesex (the church is now closed). Fred Standring was the youngest son of book publisher Walter John (Charles’s brother) and Jane (aka Jean) Hackney Standring. He was born in Willesden, Middlesex in 1897 and at the time of his enlistment his widowed mother was living at 4 Coates Place, Edinburgh. He was appointed 2nd Lieutenant with the Royal Scots on 29th November 1916 and later promoted to Lieutenant. Fred was killed in action on 6th September 1918, aged 21. Fred is buried in Sun Quarry Cemetery, Cherisy in the Pas de Calais and is commemorated on the St John, Uxbridge Moor war memorial which is now located in St Andrew’s Church, Hillingdon Road, Uxbridge, Middlesex. Eldest son of solicitor Illtyd Moline and Ellen Adelaide Prichard of 34 Blessington Road, Lee, Kent, Arthur was born in Lee on 22nd October 1880. His mother was the younger sister of Charles Standring. His brother was Lieutenant Edward Owen (see below). Arthur was educated at Felsted School, Essex, where he was a Classical Scholar where he obtained a Mathematics Scholarship to Queen’s College, Cambridge University. After leaving Cambridge in 1902 he entered the Civil Service and passed the Indian Civil Service exams before being appointed to His Majesty’s Office of Works in 1904 and later appointed Private Secretary to the First Commissioner of Works. At 2.00am ‘B’ Company counter-attacked the Germans, very heavy rifle and machine gun fire was opened by the enemy, supported by a strong artillery barrage. We got into, and secured Granby Street. Relieved midnight 22nd to 23rd. Casualties, 2 officers and 90 other ranks. Aged 35, Arthur was one of the men killed in action on 21st May 1916. According to De Ruvigny’s Roll of Honour he was serving as a Corporal at the time of his death and was buried 100 years from the German trenches at Vimy Ridge. He is commemorated on the Arras Memorial in the Pas de Calais. Younger brother of Arthur Iltyd Prichard (above), Edward, known as Owen was born on 15th August 1885 in Lee. He was educated at Lindisfarne College and Felsted School. After leaving school he worked for the Cycle Trade Publishing Company and emigrated to Australia as a farmer. On 4th May 1915 enlisted in Melbourne, Victoria. At the time he was living at 824 Malvern Road, Armadale, Victoria, with Miss Moline, a family relative, and was employed as an orchard supervisor. Owen had previously served as 2nd Lieutenant with the 3rd Queen Volunteer West Kent Regiment for 2 years. He enlisted with the Australian Imperial Force and was commissioned as a 2nd Lieutenant on 1st June 1915 and subsequently promoted to Lieutenant. After a period of training on 3rd July 1916, he embarked on HMAT (His Majesty’s Australian Transport) Ayrshire A33 from Melbourne. He arrived in Plymouth on 2nd September 1916 where he underwent further training before embarking for France and Flanders. On 16th October he marched to Re-enforcement Camp in Etaples and was posted to the 21st Battalion on 18th October. Owen was promoted to Lieutenant on 11th December and was killed in action, aged 33, at Grevilliers, Bapaume, on 13th March 1917 where he is buried in Grevilliers British Cemetery. During the First World War, the passing of the Military Service Act in January 1916 enforced compulsory military service. As a result, single men and widowers without children aged 18-41 years were now liable to serve in the Army as long as they were not in a reserved occupation. The Act was extended in May of that year to cover both single and married men and in 1918 was extended to include men up to 51 years of age. As a result of compulsory conscription, a series of Military Service Tribunals were established to hear applications and appeals for exemption from those with reasons not to serve in the Army. For men in Broadway, the Tribunals were held in Evesham. The reasons for seeking exemption needed to fall in one of seven categories; employment or educational studies that were of greater national importance, domestic circumstances, conscientious objection and medical reasons. In 1917, following compulsory conscription, William Joseph Keyte of Broadway, who was 33 years of age and working as a jobbing builder and decorator, finally passed his army medical with a Grade 3C. William had previously been rejected by the Army on three occasions. He was now considered fit for service but only for clerical duties. Represented by Mr J.W. Roberts, William appealed his conscription on the basis that he would have to close his business if he enlisted as he had already lost one of his men to the war. William appeared before Lieutenant Shelmerdine (who served with the RFC during WW1) at a Tribunal in Evesham. William stated during his appeal that there were a number of C3 single men in Broadway who did not have their own businesses who had not been called up and that he was married with three young children to support. William’s cousin, Harold Keyte, also a jobbing builder employed by many of the farms in Broadway, had passed Grade 1 fitness, however, he had received total exemption. William went on to explain that his cousin, Harold, would in spite of his employment be unable to support William’s family in his absence. The Tribunal granted William full exemption from service during the war. His younger brother Charles Hubert Keyte, had served with the 3rd Battalion, Worcetershire Regiment, and was killed in action in France on 22nd August 1916 and is commemorated on the Broadway War Memorial. Aged 31, William Stephens of New Cottages, Leamington Road, Broadway, had been granted exemption on November 29th 1916. At the time he was working as a rabbit catcher for Mr Jackson in Broadway. His certificate of exemption was reviewed in 1917 at the request of the local National Service Representative as he was known to be no longer engaged in the same occupation. At his Tribunal, William stated that he was still catching rabbits and that he could get plenty of work on the land in and around Broadway. William who was single had passed Grade 2 at his medical. William lost his appeal and his exemption from service was withdrawn. It is not known where or with which regiment William served. William was the son of Thomas and Louisa Stephens of Buckland. 75 years ago today the crew of a Whitley bomber, on a Second World War training mission from Honeybourne airfield, crashed next Broadway Tower. Pilot HG Hagen, Sgt EG Ekins, Flt Sgt DH Kelly, Sgt DA Marriott and Sgt RS Phillips did not survive when the aircraft came down less than 200 yards from the Tower on 2nd June 1943. Today a Lancaster Bomber will be performing a fly past at the site at 1.03pm. At 2.15pm the short annual inter-denominational service will be held at the memorial stone which marks the spot where the Whitley crashed. Everyone is welcome at the Tower to pay their respects to the brave airmen who all lost their lives on that date. Last weekend I visited Tyne Cot Cemetery and Memorial to the Missing outside Passchendaele near Zonnebeke in Belgium. Tyne Cot is the largest cemetery for Commonwealth forces in the world for any war and commemorates nearly 12,000 Commonwealth servicemen of the First World War and the Memorial another 35,000 men. The scale of the site is overwhelming and like other Commonwealth War Grave Commission sites the grounds are beautifully maintained, and at the time of my visit rows of ‘Remembrance’ red floribunda roses planted in front of the wall of panels and amongst some of the headstones were in full bloom. In the Visitor Centre on the approach to the Cemetery, a recorded voice reads out the names of each of the servicemen listed as ‘missing in action’ and there was a display of medals, letters and photographs of some of the men. Amongst the men commemorated on the Memorial to the Missing is Leonard Frank Green, son of Harold Joseph and Mary Ann Green, High Street, Broadway. Corporal Leonard Green of the 1st/8th Battalion Worcestershire Regiment was killed in action, aged 20, on 27th August 1917. Last weekend I visited the Menin Gate in Ypres to attend the very moving daily Act of Remembrance at the Memorial. At 8pm every evening The Last Post, the traditional final salute to the fallen, is played by buglers in honour of the memory of the soldiers of the former British Empire and its allies who died in the Ypres Salient during the First World War. At around 7.30pm the traffic under the Gate was stopped and shortly afterwards members of the local Fire Brigade and Fire Brigade Buglers marched from the market square along Menenstraat to the Gate for the ceremony whilst members of the public gathered beneath the Memorial. Private George Barnett, 1st Battalion Royal Warwickshire Regiment who was killed in action, aged 28, on 9th July 1915. Private William Harold Gabb, 3rd Battalion Coldstream Guards who was fatally wounded in action, aged 34, on 7th November 1914. Captain Archibald Robert Hewitt DSO, 1st Battalion East Surrey Regiment who was killed in action, aged 32, on 25th April 1915. On Monday 12th December the Broadway History Society will be meeting at 7pm in Broadway Methodist Church Hall, High Street, Broadway. The speaker will be Dennis Plant with a talk on ‘The Worcestershire Regiment in World War One’. Non-members welcome (£3). Several men from Broadway served with the Worcesters during the First World War: see blog post https://broadwayhistorysociety.wordpress.com/2016/11/15/worcestershire-regiment/ for further details. © Debbie Williamson and Broadway Remembers, 2014. Unauthorised use and/or duplication of this material without express and written permission from this blog’s author and/or owner is strictly prohibited. Excerpts and links may be used, provided that full and clear credit is given to Debbie Williamson and Broadway Remembers with appropriate and specific direction to the original content.